Hotly-Anticipated Kimchi Grill Opens With Little Fanfare on Washington Ave. PROSPECT HEIGHTS — A more traditional opening would have had streamers. A free giveaway, maybe. A really giant sign. But Phillip Lee is not your traditional restaurateur, and Kimchi Grill, his breathlessly-awaited bricks-and-mortar restaurant on Washington Avenue, is not your traditional Korean barbecue. "I don’t want to go crazy and create such a high expectations," Lee said of the mellow opening. "I did that with the truck and I couldn’t really keep up with the demand." The truck in this instance is the Kimchi Taco truck, whose Kim-cheesesteaks and eponymous kimchi tacos have been delighting New Yorkers in Manhattan for more than a year and will continue to operate now that its sister site is open. 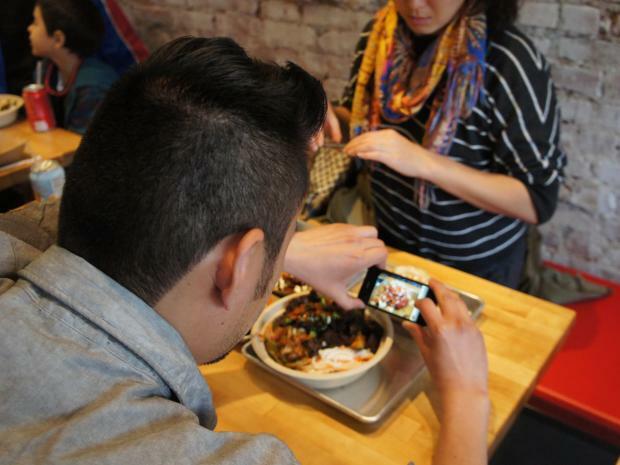 Like its forerunner, Kimchi Grill offers the same Instagram-inspiring dishes — now with better lighting. In addition to a more comfortable spot to sit while you wolf down your tacos, the new eatery has expanded on the original taco truck menu, adding burritos, Korean fried chicken tacos, and the tantelizing promise Ssam, a traditional wrap of meat and spices, to come. "This is a full kitchen and we’re able to produce a lot more things," Lee said. "We can also be more creative in terms of the menu items." Lee thinks that creativity will pay off on Washington Avenue, where he saw both a need for quick, cool food and a burgeoning community of "adventerous eaters." "I've been waiting for them to open for a long time," said neighbor Kenneth Hung, who owns Winey Neighbor down the block and was preparing to dig into a bowl of Korean shortribs — after photographing them, of course. "We need more places to eat on this street."